Traditional or Armchair Tuber propagation? 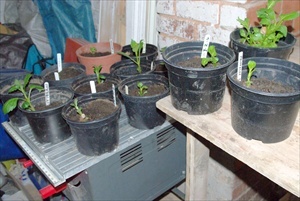 I'm sure most of you propagate your tubers in a traditional way - lots of boxes in a not too comfortable place e.g. the greenhouse or attic. Discussing this with the society chairman Ron, I suggested that to appeal to the younger generation, a more comfortable way might be more attractive and suggested the armchair approach! Ron sent me the photos below, taken this week. 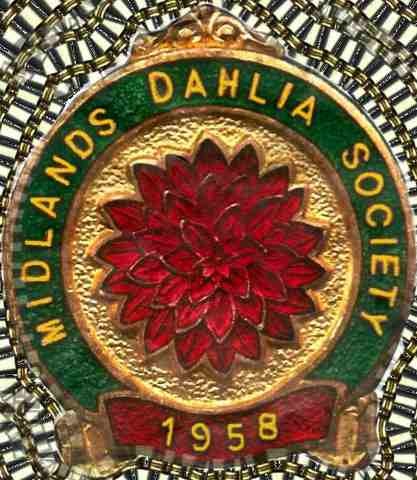 It might be that people today do not have so much time and want to grow fewer dahlias. That is my position at present. I expect all my tubers to shoot. 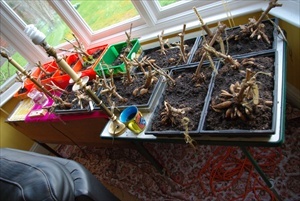 Not having a greenhouse I have set up my tubers in the living room! The picture below was taken on 1st March, during a coffee break! Below you can see where I have got to by the 24th Mar. 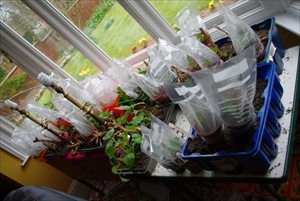 Since it is nice and warm, I place cuttings in a pot with a plastic bag over. I have already split some tubers and put them in the out house to slow them down. The candle sticks are for two purposes - I use 11w daylight low energy lamps. These provide light at 65000K equivalent to daylight. 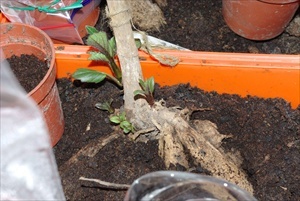 Since dahlias are 'geophytes' ( tuberous roots) if the daylight is >12 hours then roots develop, if < 12hs then the tuber develops. The other purpose is so that I can read in the evening! Oakwood Goldcrest was recommended to me by Fred. Apparently it is very difficult to 'start'. Last year I went to get one from Frankie (keyboard) Taylor in Manchester. He gave me a tuber which had already 'started'. One cutting took about 3 months before it decided to get growing! After the February committee meeting, I was talking with Society chairman Ron who asked whether I had started my tuners yet. I said I had two Oakwood Goldcrest tubers & expected them to behave. Hints were given that it was difficult to start & I had better get organised. A tip was to place the tubers in tepid water for a bit.